Harry Ross Eastwood was born in Ossett in summer 1893, the son of Frederick and his wife Emma (nee Armitage ) who married in October 1884. Harry was baptised at St Luke’s Church, Middlestown on the 13th August 1893 when his father was described as a cloth fuller of Ossett. The couple had nine children from their marriage but one child had died before April 1911. The couple were living in Ossett in 1891 and Frederick, who was born in Ossett, was living at the Globe Inn on Bank Street where he was the landlord between July 1888 and 1895. The family left Ossett about 1895 and by 1901 they had settled at Sackville Street, Ravensthorpe where they were still living in 1911. Harry's father had returned to his trade as a fuller and Harry was working as a rug weaver. Like his younger brother, also called Fred, Harry Eastwood attended Ravensthorpe St Saviour’s Boys’ School and after leaving school, he worked for the Yorkshire Electric Power Company. He attended St Saviour’s Parish church and played in the church football team; he was also a member of the Church Institute and a member of the Ravensthorpe Cycling Club. Harry Ross Eastwood was the elder brother of Frederick Eddison Eastwood . He was two years older than Frederick, but they probably signed on together at Mirfield since Harry joined the 2/5th Battalion, Duke of Wellington’s (West Riding) Regiment with service number 240719 and Frederick’s regimental service number was 240715. 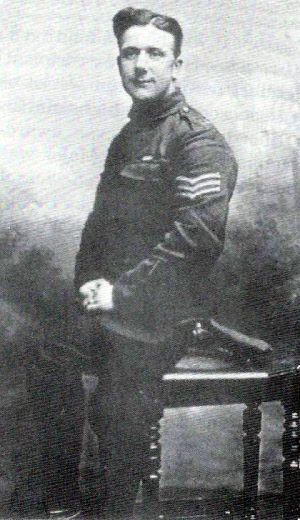 Harry was promoted to the rank of Sergeant in the months after the death of his brother, Frederick, in May 1917 and he later took part in the Battle of Cambrai, which began in November 1917. For his part in the attack at Cambrai Harry Eastwood was awarded the Military Medal, being presented with the ribbon a month later. A letter from Harry to his parents was published in the "Dewsbury Reporter" in mid January 1918. In the letter Harry is reported as saying that "they had given old Fritz the shake up of his life ......they had.... soon made short work of the Hindenburg Line, and the Germans were only too pleased to be made prisoners...their division had made a name for itself that would carry for years. It advanced furthest of all the first day and their brigade went furthest in the division and their battalion went furthest in the brigade and they were Territorials, so the regulars might put that in their pipe and smoke it!....it was terribly hard work . Their casualties were extraordinarily light, in his company they had only about three killed and twenty wounded, the majority being light." The advance of 4½ miles in one day under battle conditions was a record that was not to be beaten by the rest of the British army during the remainder of the war. Although Harry Eastwood did not mention this, the advance he describes was undertaken by men carrying more than 60 lbs of equipment. Harry was killed in action on the 25 August 1918 in the Allied Offensive called the Battle of Bapaume. 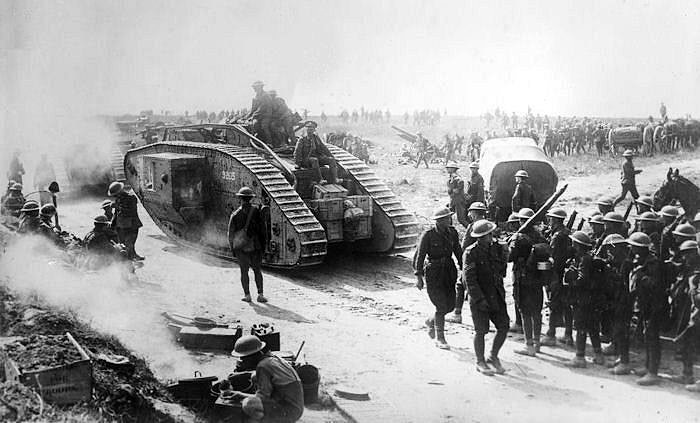 The Battle of Amiens, also known as the Third Battle of Picardy, which began on the 8th August 1918, was the opening phase of the allied offensive later known as the Hundred Days Offensive that ultimately led to the end of the First World War. Ludendorff described the first day of the battle as "the black day of the German army", since it saw the surrender of large numbers of German troops. It was also one of the first major battles involving armoured warfare and marked the end of trench warfare on the Western Front as fighting became mobile once again. Though the German forces were steadily pushed back eastwards during August 1918, it was not a full scale retreat and neither was it without heavy losses to the Allied forces as the enemy covered its withdrawal with heavy machine gun cover at every opportunity. On the 24th August 1918, Harry’s 62nd (West Riding) Division moved into the front line near Achiet-le-Grand and the following day, which would be Harry’s last, the 5th Duke of Wellington’s advanced, at first without opposition, towards their objective beyond the Bapaume to Arras Road. At 5pm the enemy shelled the British positions and at 6.15pm they launched a counter-attack, which was repulsed by the allies with rifle and Lewis Gun fire with assistance from the artillery. Above: A large scale British advance on Bapaume, France, a key city controlling access to the plains north of the Somme. Bapaume changed hands four times in the war. It was first taken by the Germans during their initial invasion in 1914; then by the British in March 1917; then by the Germans during their 1918 Spring Offensive; and finally retaken by the British in late August 1918. Harry was posthumously awarded the British and Victory medals, but not the 1914/15 Star, indicating that he did not serve overseas before the 31st December 1915. Harry’s mother died in the December quarter of 1918, aged 54. This was shortly after Harry’s death and about eighteen months after Frederick was killed in August 1917. Harry’s father’s address by the end of the war was 28, Duke Street, Ravensthorpe. Serjeant Harry Eastwood, M.M., son of Frederick Eastwood, of 21, Duke St., Ravensthorpe, Dewsbury, Yorkshire died, aged 24 years, on the 25th August 1918 and is buried at grave reference IV. A. 8 at the Douchy-Les-Ayette British Cemetery,2 Ayette is a village some 13 kilometres south of Arras on the road to Amiens, and Douchy-les-Ayette is a village 1 kilometre west of Ayette. The British Cemetery is opposite the Communal Cemetery on the north side of the road, halfway between the two villages next to a barn. Brasserie Military Cemetery, Le Fermont, Riviere, on the Bretencourt-Wailly Road, begun by French troops, which contained the graves of ten soldiers from the United Kingdom who fell in April, 1916, and one who fell in January, 1918. Favreuil German Cemetery, at the North-East corner of the village, contained the graves of 389 German soldiers and of four from the United Kingdom and one from Canada, buried by the enemy in 1916. Fremicourt Communal Cemetery, in which 20 German soldiers and two R.F.C. officers (who died in 1916 in a German hospital in the Church) were buried. Gastineau Farm French Military Cemetery, Ransart, on the Bellacourt-Berles road, in which one soldier from the United Kingdom was buried in February, 1916. Gomiecourt German Cemetery, a little West of the village, in which 126 German soldiers and 27 from the United Kingdom were buried in 1916-18. Grosville Churchyard, Riviere, in which two men of the Liverpool Scottish were buried by their comrades in February, 1916. L'Alouette French Military Cemetery, Ransart, on the Bellacourt-Berles road, in which ten soldiers from the United Kingdom were buried by their comrades in 1916. Morchies Communal Cemetery German Extension, containing the graves of 400 German soldiers, five Australian and one from the United Kingdom, who fell in 1916-17. Moyenneville German Cemetery (one of several in the Commune), in the South-West part of the village, in which eleven soldiers from the United Kingdom (including six R.F.C.) were buried by the enemy in 1916-17. Ransart Churchyard, in which one soldier from the United Kingdom was buried in March, 1917. Ransart M.D.S. Cemetery, in the village, where 12 soldiers from the United Kingdom were buried at the end of August, 1918. Sapignies German Cemetery, in the South-West corner of the village, contained the graves of 28 soldiers from the United Kingdom (including two R.N.D. ), who fell in 1916-18, and 840 German soldiers. Wailly Military Cemetery, at the North-East end of the village, contained 30 French graves and those of 23 men of the 55th Division who fell in 1916. Willow Road Cemetery, Boiry-Ste. Rictrude, in which 25 soldiers from the United Kingdom (largely of the Guards Division) were buried in 1918. There are now over 700, 1914-18 war casualties commemorated in this site. Of these, nearly one-third are unidentified and a special memorial is erected to an officer of the Lincolns believed to be buried among them. Certain graves in Plot I, Row A and B, identified collectively but not individually, are marked by headstones bearing the additional words: "Buried near this spot...". The Cemetery covers an area of 2,418 square metres and is enclosed by a rubble wall.